It is a direct substitute for fish pond filter media that scavenges toxic ammonia from pondwater. It is a true 21st century filter medium with both ion exchange and superior mechanical filtration properties. Zeolite is especially adapted as a direct replacement for sand, sand and anthracite, and multi-media water filtration media as it filters out particles as small as 3 microns, whereby sand typically filters particles of 20 microns or larger. zeolites' unique crystalline structure will double the capacity to load particulate matter which will reduce the number of backwashes required to keep the water clean and also acts as a biological filter in which bacteria mineralize the organic nitrogen compounds, a process known as Nitrification. It involves the oxidation of ammonia to nitrite and then to nitrates by autotrophic bacteria. The huge surface area of Zeolite makes it an excellent host for aerobic bacteria that eat the ammonia. The zeolite will continue to remove algae for weeks on end, depending on the amount of ammonia being excreted in the water over time. Also,unlike ordinary filter media such as gravel or sand, the surfaces of Zeolite particles are not smooth and therefore have large surface areas. Zeolite is therefore an extremely effective biological media for maximum colinization of useful bacteria. The waste produced by fish and decaying matter can quickly build up deadly ammonia levels if left unchecked. Moderate amounts of ammonia in an established pond can kill the fish that live in it. Zeolite actively removes ammonia from the water by a process called ion-exchange. This allows for more fish stocks in a smaller volume of water. Unlike ordinary filter sand, the surfaces of Zeolite particles are not smooth. Zeolite particles attract and trap extremely fine dirt particles and algae directly onto their surfaces and not just between the grains like ordinary sand. You should notice a considerable difference to the water clarity after just one day of use. This is due to a powerful negative charge that exists within the Zeolite structure that attracts positively charged cation contaminants such as ammonia and holds them within the Zeolite structure. Ammonia is one of the main food sources for algae. Zeolite removes this food source (ammonia) by a process called ion-exchange. Zeolite scavenges and holds onto the ammonium ions within it's crystaline structure. In short, no more ammonia means less algae! The nitrogen cycle is an essential part of sucessful fish ponds. In this process, ammonia is converted to nitrites and nitrates by beneficial bacterial colonies called nitrosomanas and nitrobacter. Due to it rough and porous suface, Clinofish is the ideal substrate for these biological filters to thrive. Zeolite is a 100% natural mineral. This mineral is used in industry as a pollution cleanup material. When it is time to replace the Zeolite in your pond filter, simply spread your old ammonia-loaded Zeolite onto your lawn and watch your grass grow! 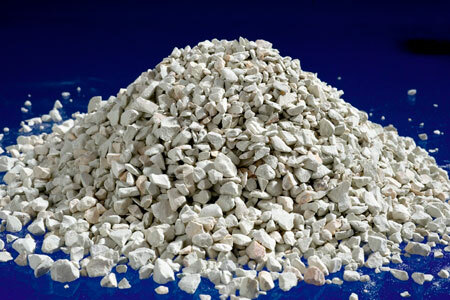 Used Zeolite acts as the perfect slow release fertilizer for your lawn and flower beds! Best of all, it is completely natural! Not only does Zeolite remove ammonia from pond water, it also removes highly toxic heavy metals such as lead as well as some of the most dangerous radionuclides like Caesium and Strontium. You can regenerate Zeolite. Simply turn off your pump, remove filter top, drain out all the water, remove the Zeolite from the filter tank and place it in a large bath or trough. Add a solution of 10% salt solution or 1kg rock salt per 10 litres water over the Zeolite filter media so that the Zeolite is fully submerged in the salt solution.Leave this over night to remove all the absorbed ammonia from the Zeolite structure. Get optimal results by using Zeolite at the end of the filtration chain in new ponds or ponds with large fish stocks.